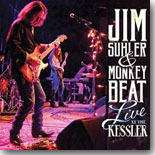 Fans of Texas band Jim Suhler & Monkey Beat will be excited to have this new live album, Live at the Kessler, to add to their collections. It's this month's Pick Hit. This month's Surprise pick allows us to pay a visit to the "blues motel" of Chicago singer Liz Mandeville, with her new disc, The Stars Motel, featuring lots of guest appearances on the album's 11 cuts. A special 3-CD compilation pays tribute to 40 Years of Stony Plain, featuring many artists that have appeared on the Canadian label during that time. It's our Flashback feature this month. Our What's New section features reviews of new CDs from Matthew Skoller, Bonnie Raitt, Lucky Losers, Mick Kolassa, Ilana Katz Katz, Mike Sponza, Isaiah B Brunt, and more.